Southwest Human Development hosted its first assistive technology challenge this fall to benefit young children with disabilities. 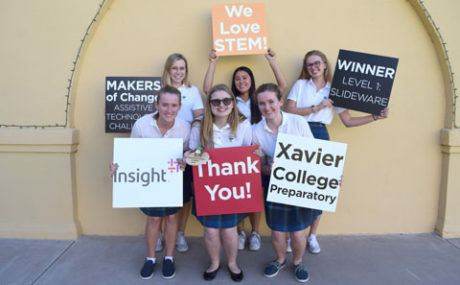 Members of the winning Xavier team in the MAKERS challenge included, from left: back row, Erica Stutz, Nina Mackey and Gia Mangnoni; front row, Veronica Tanner, Shea Nowicki and Katherine Tanner (photo courtesy of Xavier College Prep). Sponsored by Insight, with support from Arizona State University and Intel Corporation, the MAKERS of Change Assistive Technology Challenge brought together Valley high school Science, Technology, Engineering and Math (STEM), coding, robotics and technology teams to troubleshoot and create “real world” solutions using Internet of Things (IoT) technology that will help improve the lives of young children with disabilities. Among the winners on Oct. 13 were two teams from Brophy College Preparatory, and one team from Xavier College Prep. Xavier’s team of six young women was named the Level 1: Slideware winner. This level is for teams that may not feel they have the time or expertise to fabricate a physical product, but they have a strong idea that they outline with pictures and descriptions. The trophy is labelled Slideware, because essentially your “product” is a set of slides showcasing an idea. The “Brophy Mach 2.7” team received the Level 2: Build Design award. This level is for teams that had an idea and physically built it. They progressed from the concept phase to creating a physical product that can interact with a child. The “Bronco Boys” team from Brophy was given the Best in Show award, which goes to the most promising idea for actual implementation with young kids. The full scoring criteria all focus on coming to the conclusion that an idea is worth developing. This goes to the best idea from any level, and includes a $500 cash prize. “We’re turning to the next generation of technology leaders to develop implementable solutions to challenges children with disabilities experience in their daily lives,” said Jake Adams, chief development officer at Southwest Human Development. Each high school team of no more than six team members, plus their coach, chose one of four scenarios of a real-life problem that is experienced by children with disabilities. Teams had four weeks to develop and build a solution for the scenario using IoT technology and were matched with a professional mentor who guided them through project ideation and execution.